It is just past 4 p.m. at Lender Court in Hamden. In roughly three hours, the Quinnipiac men’s basketball team will host Saint Peter’s in its final home game of the season. Every seat in the arena is empty. Even the court is vacant as players have yet to emerge from the locker room to get some shots in before pregame warmups. Press row is also empty, except for one seat that has been occupied by the same man for over 20 years. The Bobcats fans who will start to file in as the hours pass may not recognize his face, even if they shook his hand and said hello. But all of Bobcat Nation knows his voice. 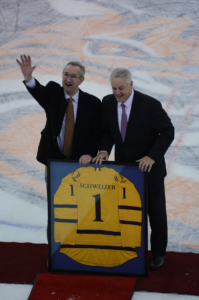 Bill Schweizer, Quinnipiac’s basketball and ice hockey play-by-play announcer, has been a fixture on the school’s airwaves since 1997. Even now as he strolls down the home stretch of his illustrious broadcasting career, he still makes sure he is the first one at the arena to prepare for the evening’s game. Actually, the prep work begins before Schweizer takes a seat in his usual spot in front of midcourt. He overlooks his notes in between sips of coffee for three hours at home before heading to the arena to study them again. His partner and color commentator, Bill Mecca, who will join Schweizer courtside in an hour or so, admires his friend’s punctuality, but from a distance. Schweizer has always taken pride in doing things the right way, regardless if others understand. Frankly, they don’t have to. Besides, it’s not the first time he’s been called crazy. Long before he was the voice of the Bobcats, and before his voice took fans through Villanova basketball’s historic NCAA Tournament run in 1985, Schweizer was figuring out exactly what he wanted to do with his life. His plan of playing major league baseball shattered with the disc in his back, which popped shortly before completing his senior year at Iona. Shortly before the MLB draft, while Schweizer was still nursing his ailing back, a scout from the Cleveland Indians gave the soon-to-be college graduate a call. He wanted to know why Schweizer hadn’t been playing over the last few months of the season. That was it. The dream was over. “He might as well have shot me with a gun,” Schweizer said of the brutal conversation. With hopes of pro baseball officially dashed, Schweizer searched for a plan B. He wanted to stay around sports and was confident in his writing as an English major, so he decided to try sports reporting. With nobody giving Schweizer a chance, he decided to take one on his own after stumbling across a newspaper ad for a 15-week broadcasting course. Again, many thought he was crazy. It went a lot of places from there, including CBS radio, where Schweizer filled in as the play-by-play announcer for the MLB Game of the Week and Sunday Night Football. After a pit stop in New Haven to announce minor league baseball, Schweizer headed down Whitney Avenue to a small school in Hamden that had just made the jump to Division-I athletics and needed a talented voice to elevate its game. It’s the same game Schweizer has helped elevate since Quinnipiac basketball performed down in Burt Kahn Court before TD Bank Sports Center was built a decade later in 2007. 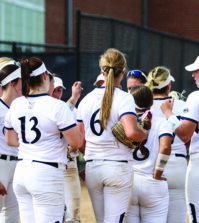 As Bobcats athletics have continued to rise over the years, Schweizer has been there to narrate all of it with his usual melodious storytelling. The story is nearing a close, but Schweizer refuses to let the impending end of a 45-year career interfere with what still needs to be done right now. That’s just not who he is. Maybe a man like Schweizer can’t afford nostalgia. He has made a Hall of Fame career out of telling an audience what is happening here and now, down to every pass, shot and even a game-winner from half court at Central Connecticut that would appear on SportsCenter later that night. Schweizer was always there to tell it all as the action was unfolding. As the clock on Schweizer’s career draws closer to zero, he finally allows himself a time for reflection. Schweizer puts his prep work on hold to look around Lender Court, and the sights he is taking in for the last time. He pauses before turning his attention to the yellow rafters stretching across the ceiling above. His peers know who the real lucky ones are. Mecca and Schweizer started their journey calling Quinnipiac basketball on the radio. The duo decided to end it where it began by taking the ride to Albany to announce the first round of the MAAC Tournament on Thursday. Whether the Bobcats win or lose, Schweizer will be signing off for the last time before selling his Connecticut home and heading down to South Carolina, where he will enjoy retirement with a golf club in hand instead of a microphone. Still, thanks to his success that helped the school reach new viewership, he will never be far away from his second home. As Schweizer continues to take in the scene around him at Lender Court, it’s easy to follow his eyes and wonder if the school will make room for his own banner to celebrate his accomplishments. His partner would support it. Perhaps a vocal print is a more fitting term. It’s not something you can see, but you would know it if you heard it, and you’ll miss it when it’s gone.